It's now the fall of 06, and the plan to spell congregate with a k is starting to come together. The front page is updated with more information, and the site starts taking game submissions from developers. In November of 2006 Kongregate starts allowing people in their private alpha; they also get the "Kongregate" which other then the moving of the "Beta" logo hasn't changed till this day. 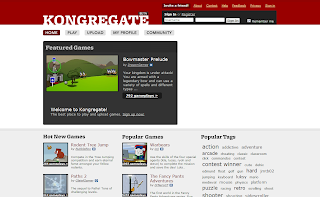 And in January of 2007 Kongregate goes public! (You can see the news announcement here!) The site now looks very familiar for anyone who has been on the site for over a year. There's now forums, a working chat with multiple rooms and moderators. Word of the game contests had begun to spread throughout the flash developers community. 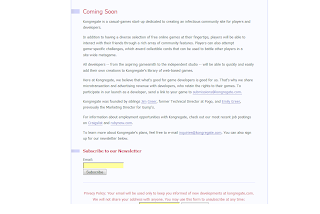 Kongregate also is starting to look at games to sponsor. The first of which would be RotaZion-Which was on of the first games on kongregate! 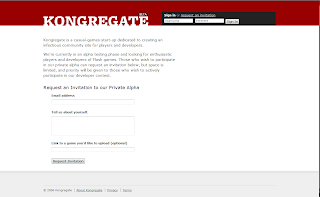 Kongregate is really starting to take shape, and soon the site would officially move past the alpha stage and onto the oh so familiar beta stage.